with this Newsletter we want inform you about the games of our you member franjos Games. 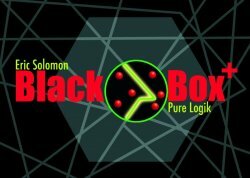 Black Box is a modern classic among board games. It was first published around fourty years ago in different countries. In Germany the first edition was published in 1978 oddly enough with two different names. It was first called LOGO, later ORDO although it has just been two years in the programm of its publisher "Parker". In its original country Great Britain Black Box was much longer in the market and so was able to create a lot of fans. This great jewel of deduction games was part of our programm for fifteen years since 1990. To the twentieth anniversary of "franjos" the game appears in a new production including a new variant which requires even more thinking and so will impress the old fans of the game too. At the side of the original version this production includes the hexagonal version of BLACK BOX. Order the game by Spiel direkt eG. In the game of CINCO, everybody has to make a straight line from five of his own playing pieces. To this end, the cards played determine where you are allowed to place. The smaller the card value, the more placement possibilities exist. 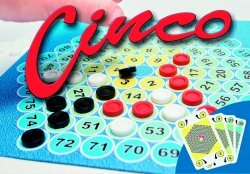 Played quickly, exciting every time - that is CINCO! When Petrus Venerabilis takes office as the abbot of Cluny in 1122, he finds the monastery in a bad economic state. In order to secure the survival of the monastic community, he calls on the monasteries associated with Cluny for support. The monasteries are to deliver food to Cluny. In return, they will obtain letters of indulgence. Each player is an abbot who leads such a monastery. Each year (i.e., every round), players produce units of food and then deliver them to their abbot, Petrus Venerabilis. The player who delivers the most food units in a round gains the most letters of indulgence (victory points). However, he will get the least support (denarii) for further investments. Whoever delivers the fewest food units in a round receives the fewest letters of indulgence, but the most denarii for further investments. 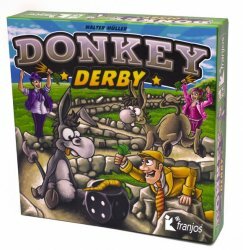 In this exciting donkey race, each player moves every donkey. Players bet on the future winner. If you make the right bet early, you'll get many victory points in the end. Bet later, and you can better estimate the finish and get points more safely. But the die plays a role as well: Should I advance my favorite with the "3" I've rolled or should I try to roll a higher number? If my luck with the die doesn't meet my calculations, the malicious joy of the other players is guaranteed. 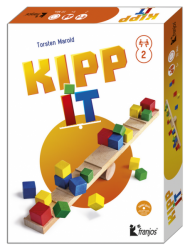 KIPPIT is a fast and amusing little game of action for two skillful players. You try to put as many of your cubes as possible onto the higher end of the small wooden seesaw, until the seesaw tips. Some of the cubes are likely to tumble off. Then these have to be picked up by the other player. Whoever gets rid of all his cubes first, wins. THE GAME WILL BE AVAILABLE AT THE THIRD WEEK OF APRIL. Pre-order the game by Spiel direkt eG. 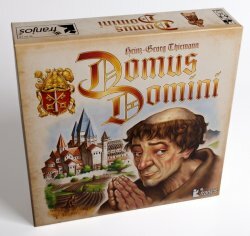 At Spiel direkt eG you will find an extraordinary range of games of the highest quality.